BMW has supplied a fleet of 4,000 vehicles for use in transporting athletes and officials to sporting venues during the event. Each vehicle has been fitted with custom satnav software, the Dynamic Olympic Route System, which is supposed to guide drivers along the Olympic Route Network, the specially designated Olympic only lanes in London. At least that is the intention. The trouble is the software has been beset by glitches and crashes which see the system default to the standard routing which has no knowledge of these special lanes. BMW is working to resolve the issues but in the meantime, drivers are seeing their journey times in some cases double. Perhaps it might have made more sense to use drivers with local knowledge? The Germans were poking fun at our rubbish olympic arrangements [and the weather] the other day. We should give them the same now. I suppose testing it beforehand would be too obvious? Drive carefully; the Government needs all the Taxpayers it can get. A German owned company? As opposed to an Indian one? But where are they made? Why didn't they get TomTom to do the navigation system? Perhaps it might have made more sense to use drivers with local knowledge? Posted: Fri Jul 27, 2012 9:04 am Post subject: ? What's the problem? So the drivers are not from GB THEN? I don't see what all the fuss is about if they had hired drivers from Londan there would be no problem as they would not need a satnav? That's the problem with this island to many people hiring the cheapest laber that most probely have no clue of how to get around. Here is wales where I am all I'm looking forwoord to is having some proper news no more Olympic rubbish they got 22 Chanel's just for them and there taking other free channels at lest RT has some news. It's all about sponsorship that is why the locals in London are not allowed to have goods with anything to do with the olympics! so were is all this so called cash we will get go, to the supper rich companies. I don't think it was so much a contract, but who was prepared to 'sponsor' the event by supplying the cars. 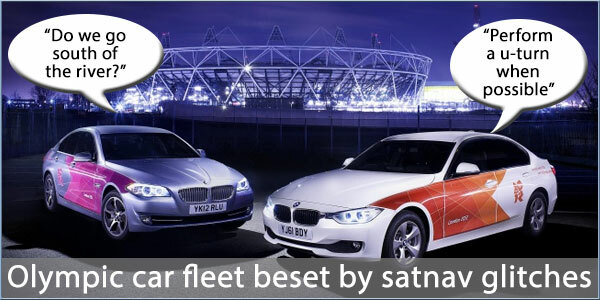 And does that mean in a couple of months there's going to be 4000 low mileage 'ex demonstrator' BMWs for sale?